Goal setting is an absolutely essential part of the lives of managers and CEOS. Without setting concrete goals, you risk losing focus entirely and lose investment in what really matters. But for employees, goal setting may seem like a huge waste of time only meant to eat away at their valuable hours. I was told to use OKRs when I first started at Weekdone. This seemed utterly useless to me at first. Now, I’m a huge believer in the OKR methodology and quarterly goal setting. Having an employee guide to OKRs is equally useful. So, what happens if your boss comes into the office and says “we’re going to start using Objectives and Key Results for quarterly goal setting from now on?" Well, we'll help you figure it out. 5 reasons OKRs help you find peace of mind. When employees aren't super enthusiastic about cultural change, goal setting systems tend to fail. Typically, everyone is either stuck in the old ways (especially if the system is “no system”) or the employee feels that learning a new system is a waste of time. At its very core though, having a management system is essential. Getting started with OKRs is just one way to approach this. Everybody in a team should have a clear understanding of big-picture goals when using OKRs. After all, more clarity is a lifesaver! When everyone knows how their work matters, it increases overall engagement, motivation, and determination. Having an employee guide to OKRs helps you get established with one of the easiest and most user-friendly systems out there. You should give them a try. This guide will show you exactly how to get started. OKR is a simple process of setting company, team and personal goals. OKR is a simple process of setting company, team, and personal goals while also connecting each of those goals with 3-4 measurable results. As you achieve those results, the whole Objective gets marked as 'done.' This means that while you do your everyday tasks, you can see how they impact your long-term goals. This will help you eliminate tasks that may seem important at the time, but don’t help you realize your larger Objectives. Like they say: “work smarter, not harder.” After 3 years of using OKR methodology, I can safely say that I save about 5 hours a week by only focusing on what’s really important using my own employee guide to OKRs. I am more relaxed about work and my bosses are happy. Under each Objective, define 3-5 measurable results. Key Results show the most important things you need to do this quarter. It's not a list, so the tasks you do daily do not belong here. Using OKRs helps you to be happier and more engaged with your work. According to a customer survey we did, an average Weekdone user is more than twice as engaged as the average employee in the US and 6 times more engaged than the average employee worldwide (US employee engagement rate is 30% and worldwide 13%). People who participated in the survey also enjoy grossly positive workplace relations. This adds so much to the working environment and team spirit. Take a look at some examples of OKRs. You need to evaluate OKRs every three months. New goals are then set at the beginning of every quarter. For an employee, this means that you don’t have to waste time in 1-on-1 meetings every month, giving you more time to spend working towards your goals. Forgetting your goals and focusing on unimportant tasks happens quite often when you are only graded once a year during a yearly review. When the year ends, it’s terrible to discover that you have done the wrong things and that management isn’t happy. With quarterly OKRs, you’ll avoid such an unpleasant demise by constantly focusing on your goals. It’s a lot less stressful and adheres to a stricter routine, putting goals into perspective so you can always keep track of them. Take a look at our OKR resources. These give you more insight and more examples to get you started on your road to using OKRs. Objectives are qualitative and describe the desired outcome. So, Objectives give you clear tasks to help you stay on track. There is no need to have numeric metrics for Objectives (you’ll have those with Key Results) as Objectives are more visionary and aspirational, not a performance indicator. Inspirational: They should excite you and give you a reason to be psyched on Monday morning when going to work. Objectives like “Get the new product ready for launch,” is a good example here. Key Results are the metrics that drive your Objective forward. They help emphasize the important element of "focusing" on your Objective by providing measurable ways to move towards goal completion. Key Results are not the same as the SMART model, but they both come from the MBO style of management. Metrics, timing, and alignment are all important factors of both methodologies. 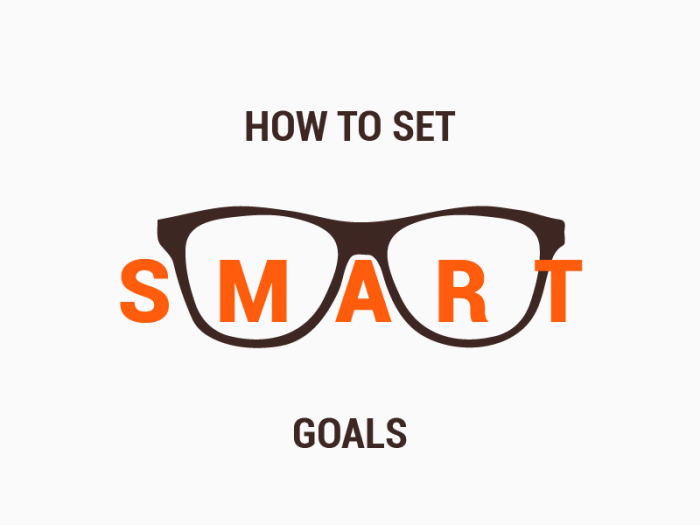 However, SMART goals are isolated. 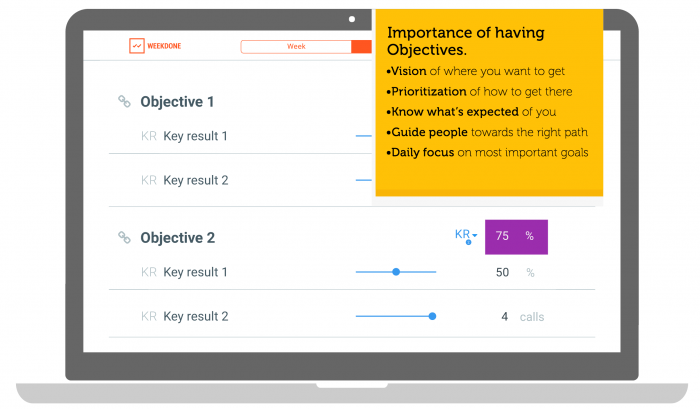 Objectives and Key Results work together but are also their own separate categories. If you are already using the SMART model in your organization, assessing your Key Results based on them serves as a good model to start out on. That being said, Key Results are not SMART goals and do not have to follow the same criteria as long as they remain metric driven. It’s important to decide beforehand what is considered a success in KRs. You must be sure about what is expected of you. Do your managers want you to achieve 100% on or goals or should you set them so ambitious, that 60% is a good result? If you’re tasked with setting your own KRs, make sure you and your boss have a clear understanding of what you're supposed to do. Often OKRs are set very ambitiously and a 70% completion is considered a job very well done. You should go over your OKRs every week. You need to make sure that the work you do is important. Update the progress made on your KRs every week for the best results. After all, the satisfaction of marking items as "done" is definitely worth it on your journey for the best employee guide to OKRs. It's really like taking items off your little work bucket list. Shawn Rucks is the CEO of deverus. He's also a Weekdone OKR software user, so he knows the challenges with getting started with OKRs. One of these struggles comes in the form of moving goal planning from once a year to quarterly OKRs. This is an absolutely enormous cultural change that requires commitment on every level. “It is hard, because you are asking somebody to clearly define what they are going to do and how to get it done” said Rucks. If a leader believes in a system, adapting is much easier. “And thanks to Weekdone everybody else can see what I do and that has made an impact,” said Shawn. You can see all the user cases about using Weekdone here. Many resources are available to make your experience with OKRs less daunting. You can take a look at our infographic on OKRs or our FAQ page. In addition, we have a comprehensive overview of the OKR methodology for a good employee guide to OKRS. With specialized, free onboarding and active customer support, you can also contact us at any time. 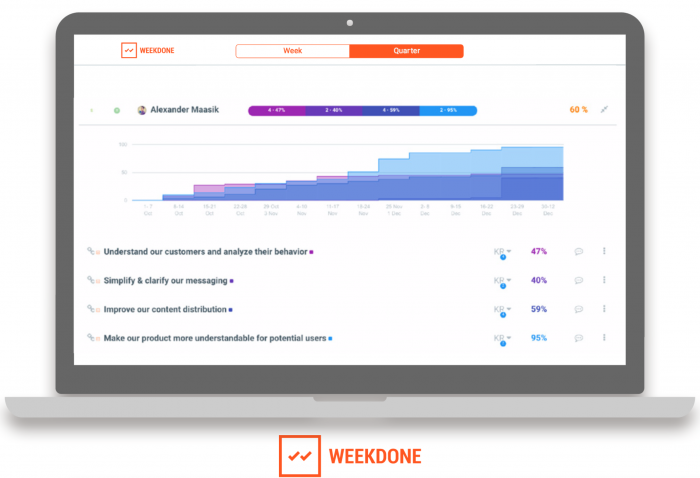 Weekdone serves as a great way to start implementing OKRs . The trial is free and you can sign up here. Remember to follow us on Twitter, Google+ and Facebook for all about okrs, hierarchial okrs, company OKRs and more!